Honor the Empire and their fantastic fighting forces! This Star Wars Aces of the Empire by Mike Kungl Gallery Wrapped Canvas Giclee Art Print features a stunning image of Imperial TIE Fighter Pilots standing at the ready, with TIE Fighters flying all about. Complete with the words, "Imperial Navy. 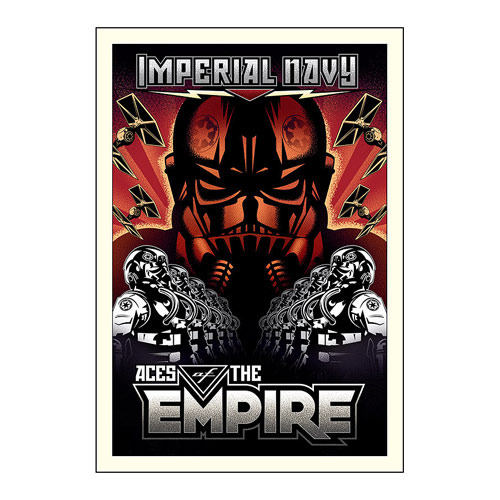 Aces of the Empire," this giclee is a limited edition of 95 pieces hand-numbered and signed by the artist! Printed on canvas and complete with a certificate of authenticity, this giclee measures 26-inches tall x 18-inches wide.